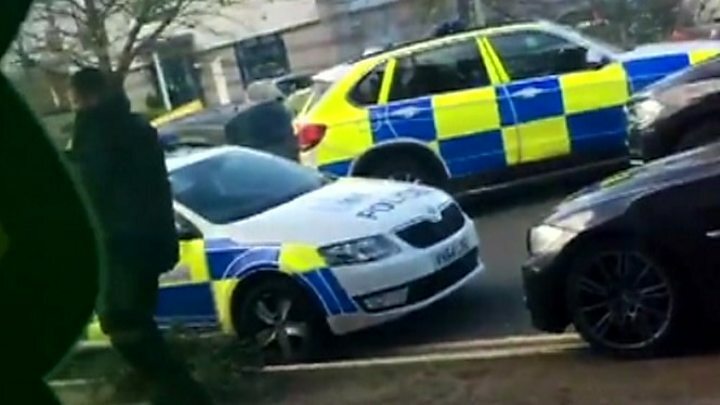 Media captionMegan Westwood: "We got evacuated one by one"
A suspected gunman was arrested after police ended a four-hour siege at a bowling alley in Nuneaton. Officers were called to MFA Bowl in Bermuda Park at around 14:30 BST on Sunday after reports a man with a shotgun had taken two hostages. A 53-year-old man was arrested on suspicion of making threats to kill after police stormed the building at about 18:30 BST. The suspect was treated for minor injuries. Two other men were uninjured. Ch Supt Alex Franklin-Smith, from Warwickshire Police, said officers brought the incident to "a peaceful resolution". The siege was "unconnected" to terrorism, he added. Police said at about 19:00 BST that the cordon at the retail and leisure complex had been lifted and advised people they could now and any vehicles left there overnight. The gunman reportedly walked into MFA Bowl and yelled "game over" before ordering people to get out. About 40 or 50 people were said to be inside the complex at the time. Media captionEyewitness: "The guy ran up to the door with a gun"
Both of the hostages - a duty manager and a bowling lane host - were unharmed but treated for shock. Chris Clegg, operations director of MFA Bowl, said: "It's obviously not an everyday situation. The ambulance, police were checking them and making sure they were OK."
The firm's chief executive Mehdi Amshar said he understood the man was known to a member of staff at the bowling alley. Specialist firearms officers and police negotiators were sent to the scene, and used flash bangs - which create a loud noise and bright light - to enter the premises. Warwickshire Police said officers were called to reports of a man - described by eyewitnesses as "in his 40s" with a gun "slung" over his shoulder - with a firearm at 14:30 BST. One witness, Chris Turner, told the BBC he was walking past the front entrance to the bowling alley when the man "ran up to the door". He had "a gun in his hand" and told him to "get out of the area", he said. Mr Turner said the man shouted at a crowd of people outside to leave, saying: "I've already told you once." Eyewitnesses also spoke about how they fled the bowling alley, while others hid in toilets, as the gunman brandished a weapon above his head. Alex Mulholland said he was bowling when he looked up to see a man holding a gun over his head. "He was saying 'game over, game over', everyone was shouting, screaming, panicking, trying to get out and I didn't know what to make of it, really," he said. "I ran, got my things as quickly as I could and got out of there." Other businesses in the leisure park, including a children's soft play centre and restaurants, were put into lockdown. 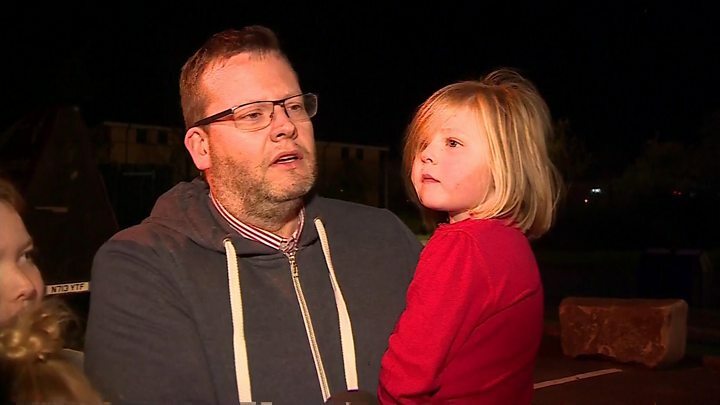 Families inside the soft play centre told the BBC they barricaded the front door with tables and chairs. Kelly Perrett, who was at the Frankie and Benny's restaurant, told the BBC she was "hiding in the toilet with about 20 people". "It looks like police have got the bowling alley surrounded. The police told me that the gunman is near the door with a hostage," she said as the incident unfolded. 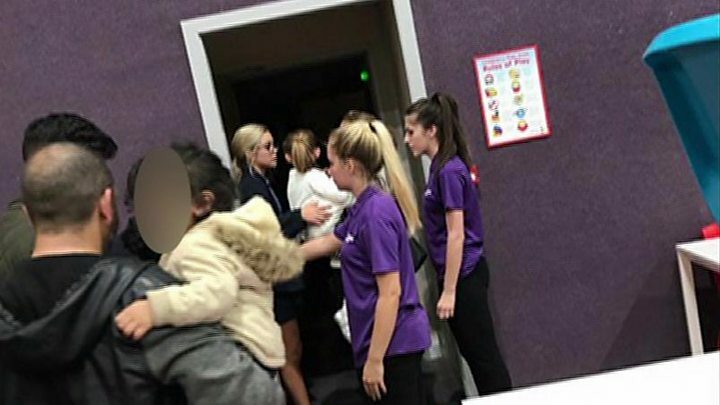 Megan Westward said she was about to leave a children's soft play centre when staff told her to move away from the windows. "There are quite a few bullet proof vans," she said. 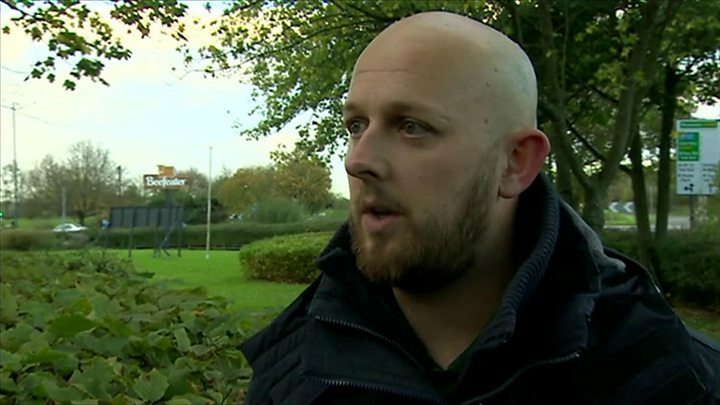 "We've just seen an air ambulance take off, there are ambulances and there are police in full body suits with guns." She was then evacuated to a nearby hotel. Following the conclusion of the siege, forensics officers were examining the scene and a red Peugeot 307 car was removed by police on the back of a vehicle transporter. Bermuda Park includes a Holiday Inn Express hotel, a gym, a DIY store, a soft play centre and several restaurants. Are you in the area? If it is safe to do so, share your experiences by emailing haveyoursay@bbc.co.uk.